One of the most important components of properly closing your swimming pool is the choice of winter chemicals you put into your swimming pool. Arctic Armor has the best winter chemicals you can buy and the best part is that they are affordable. By purchasing the right products the first time will not only save you money on the opening of the pool but it will save you time. By adding the right chemicals you can ensure a clean swimming pool upon opening. Poolandspa.com offers a few chemical packages from Arctic Armor that can assist you to keeping your swimming pool well maintained. Some of them include the Arctic Armor Chlorine Winterizing Kits, Arctic Armor Chlorine Free Winterizing Kits and the Super Winterball Natural Enzyme Super Winterizer. By adding any of these quality products to your swimming pool before you close for the winter you can almost guarantee a sparkling crystal clear swimming pool in the spring. These kits include everything that you will need to properly close your pool. Each kit is specifically packaged for a specific pool and they have one for every size pool. Every kit comes with detailed instructions on how and when to put the chemicals in. Plus, for first time swimming pool owners or maybe you want to save money and close your pool yourself, each kit comes with a free set of pool closing instructions. The Arctic Armor Chlorine Winterizing Kits are available for three different pool sizes. There is the 7,500 Gallon Kit, the 15,000 Gallon Kit and the 30,000 Gallon Kit. Each kit can be used with either an above ground swimming pool or an in ground swimming pool. Each chlorine winterizing kit comes with Terminator Algaecide or Halt 50 Algaecide, Super Rust and Shock and Burst Shock. The Terminator Algaecide is a non-foaming chemical that is designed to eliminate all types and strains of algae that forms in the pool over the winter months. A benefit of using this product is that it will not affect your swimming pools pH levels. This product will not stain your swimming pool or leave behind any slimy residue. You can also use the Terminator Algaecide during the swimming pool season. The Halt 50 Algaecide is in concentrated form and it also will eliminate all strains and types of algae. Just a quart of this super chemical can treat up to 240,000 gallons of water. Like the Terminator this chemical will not stain your pool and it leaves no foul odor behind. Each Chlorine Winterizing Kit comes with Super Rust and Scale Remover. This product will eliminate stains, scaling and even brown water from forming. It works great on Iron, Copper, Cobalt and Manganese, all metals that commonly cause stains in the swimming pool. The 7,500 Gallon Kit includes One Pint of Terminator Algaecide, One Pint of Super Rust and Scale and One Pound of Burst Shock. The 15,000 Gallon Kit comes with, One Pint of Halt 50 Algaecide, One Quart of Super Rust and Scale and Two Pounds of Burst Shock and the 30,000 Gallon Kit comes with, One Pint of Halt 50 Algaecide One Quart of Super Rust and Scale and Three Pounds of Burst Shock. The Arctic Armor Chlorine Free Winterizing Kits offer the same items as the Chlorine Winterizing Kits with one exception. Rather than the Burst Shock this kit includes Blitz Shock and Chlorine Free Shock. Blitz Shock will help burn off or oxidize any organic pollutants that form in swimming pool. Some of these include bacteria, algae, rainfall and even sunlight. Not only can you use this product to close your pool but it can be used a clarifier during the swimming pool season. If your pool water is cloudy the Blitz Shock will restore your pool to crystal clear once again. The Arctic Armor Chlorine Free Winterizing Kits are available in three sizes, the 7,500 Gallon Kit, the 15,000 Gallon Kit and the 30,000 Gallon Kit. The 7,500 Gallon Kit comes with One Pint of Terminator Algaecide, One Pint of Super Rust & Scale and One Pound of Blitz Shock. The 15,000 Gallon Kit comes with One Pound of Halt 50 Algaecide, One Quart of Super Rust & Scale and 2 Pounds of Blitz Shock. Lastly, the 30,000 Gallon Kit comes with One Pint of Halt 50 Algaecide, One Quart of Super Rust & Scale and 3 Pounds of Chlorine Free Shock. The Super Winterball Natural Enzyme Super Winterizer is a relatively new product. This is a super clean way to keep your swimming pool clear and bacteria free over the long winter months. The Winterball works in conjunction with any of the two winterizing kits we mentioned. This product contains all natural enzymes that are 100% safe for your swimming pool. You can use this product with either an above ground swimming pool or an in ground swimming pool. Some of the features of the Super Winterball Natural Enzyme Super Winterizer is that it will help keep your swimming pool clear and stain free all winter season. 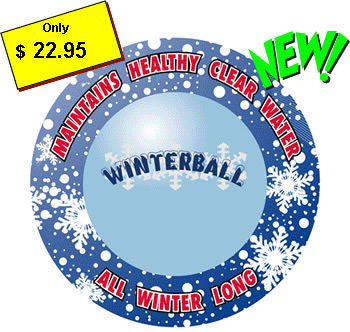 The winter ball releases a slow steady of enzymes that help keep the pool clean and bacteria free. It is 100% on all types of pools, filters and winterizing kits. Simply follow the instructions and when you open your pool in the spring, you will have a healthy, clean pool. By using the winterizing kits we mentioned here, you can really save a lot of time and a lot of money. How many times have you opened your swimming pool to green, bacteria filled pool of water? It could take lots of money and lots of time. In the spring when you open your pool, you don’t want to spend time vacuuming, shocking and scrubbing the pool just to get it clean, you want to swim. By using the right combination of winterizing chemicals, you can do just that. Just follow all of the directions on the winterizing kits and the pool closing instructions and you will be amazed at how your pool opens next year. Feel free to contact us at Poolandspa.com if you have any questions or need any additional information. © Copyright 1994-2013 by Poolandspa.com Inc. All rights reserved. No part of this electronic publication and it's contents may be reproduced, electronically or otherwise, nor distributed in any manner without the prior expressed written consent of Poolandspa.com Inc. Any Copyright infringement will be prosecuted to the fullest extent of the law. Web Site Created by Master Image. Web site dedication.